Gary Cooper possessed a distinctive screen image that mirrored much that was worthy in the American character. By box office figures, Cooper was the most popular male film star of the 1930s, 1940s, and 1950s. Although he had great limitations, such accomplished performers as Charles Laughton, John Barrymore, and Charles Chaplin considered him America's most skilled film actor. Gary Cooper was born on May 7, 1901 in Helena, Montana, to Charles Henry Cooper, a lawyer, and Alice Louise Brazier, both English immigrants. As a lawyer, assistant U.S. attorney, and State Supreme Court justice, Charles Cooper was grimly determined to bring order to Helena, which still honored the vigilante tradition. His wife was equally fixed upon providing her two sons with a proper education, removed from the crudeness of a small western community. For four years Cooper attended Dunstable Public School in England. Totally unprepared for the rigor and snobbery of English secondary education, he found the experience sufficiently painful to become permanently shy and withdrawn. Cooper worked on his father's ranch in 1918 and 1919, then enrolled in Wesleyan College at Bozeman, Montana, in 1920. After a serious automobile accident, which left him with a broken hip (and a characteristic gait), Cooper transferred to Grinnell College, in Grinnell, Iowa, in 1921. At Grinnell he proved to be an indifferent student. Art ranked as his sole passion, but he displayed little talent as an illustrator. Quitting Grinnell in 1924, Cooper went to Los Angeles. There he unsuccessfully sought work as a political cartoonist or artist for an advertising agency. He became a door-to-door salesman of discount coupons for a photography studio in order to earn a living. Cooper took the advice of two Montana friends who were former rodeo stars, and joined them as an extra in motion picture westerns in 1925. Soon realizing how much leading cowboy players earned, he decided to become an actor. He took the name "Gary" to distinguish himself from an abundance of Frank Coopers then in Hollywood. But not until The Winning of Barbara Worth (1926) did he secure a key supporting role. Although the film received mixed notices, Cooper won much praise. Paramount Pictures soon signed a contract with him. Cooper possessed a natural, understated capacity to project himself before a camera. In Wings (1927), a World War I epic, he appeared for only 127 seconds, yet his portrayal of a doomed flyer stole the film. Somehow, Cooper bridged the gap between the male acting styles of the 1920s. Neither completely the child-boy of Buddy Rogers, nor the hardened warrior of William S. Hart, he managed to combine a measure of innocence about women and ideas with a knowledge about the ways of the West and its traditions. Cooper was soon starring in films and, with the aid of skilled sound engineers, easily shifted his talents and light baritone voice to talking pictures. One of his first, The Virginian (1929), helped to stereotype him as the classic cinema man of the West (even though fewer than one-fourth of all his feature films were Westerns). In Morocco (1930) Cooper played a narcissistic cad in the Foreign Legion, while in A Farewell to Arms (1932) he sensitively portrayed the suffering protagonist of Ernest Hemingway's novel. His critical notices tended to improve, though some reviewers dismissed him as a mere matinee idol. Cooper married Veronica Balfe, an aspiring actress, on December 15, 1933; they had one daughter. The marriage supposedly indicated Cooper's inclination to settle down after a series of torrid love affairs with such actresses as Clara Bow and Lupe Velez. But Cooper proved an unfaithful husband. He frequently had affairs with female costars and briefly separated from his wife in 1951-1952. Part of Cooper's success on screen was due to his capacity to appeal to both women and men. Women found his boyish charm and good looks irresistible. Men regarded his unassuming, polite manner less threatening than the style of such other love idols as Clark Gable. Between 1936 and 1943, Cooper's career took a new direction. He enjoyed a succession of box office and critical triumphs that transformed his screen image from the young (sometime) roue to an inherently good Mr. Everyman. For director Frank Capra, Cooper starred in Mr. Deeds Goes to Town (1936) and Meet John Doe (1941). An Academy Award and New York Film Critics Prize for best actor resulted from his portrayal of the title character in Sergeant York (1941). A year later he gave what some critics held to be an even finer performance as Lou Gehrig, in The Pride of the Yankees. In 1943 he again starred as a Hemingway hero in For Whom the Bell Tolls, which, while drained of its leftist political material, proved a box office hit because of the romantic pairing of Cooper and Ingrid Bergman. Most of these films cast him as a noble hero. "Whatever the deep psychological or physiological roots of his fascination" wrote the New York Times's Frank Nugent in 1942, "the simple fact is that to a large bloc of the population, Mr. Cooper has come to represent the All-American man." That image was hard to maintain between 1943 and 1952, as Cooper groped for good vehicles. Such attempts at self-parody as Casanova Brown (1944) and Good Sam (1948) served him ill, and potboilers like Dallas (1950) were best forgotten. His boyish thinness turned to middle-aged gauntness, and improper lighting often caused him to appear far older than his years. Furthermore, into the 1950s he was wracked by an unhappy personal life and ill health (a painful back and ulcers), which often prevented him from selecting good scripts and delivering able performances. His lack of self-confidence caused Cooper to rely for career advice on such middlebrow trendsetters as director Cecil B. DeMille and gossip columnist Hedda Hopper. They encouraged him to protect his screen image by choosing "safe" stories. The influence of DeMille and Hopper showed in other ways. In 1944 they persuaded Cooper to deliver a radio talk opposing President Franklin Roosevelt's bid for reelection. Cooper referred to Roosevelt's "foreign notions," adding, "I don't like the company he's keeping." Some construed such references as aimed at the president's Jewish counselors. Two years later Cooper testified as a "friendly" witness before the House Un-American Activities Committee (HUAC), which was investigating Communism in the film industry. He vaguely described Communist infiltration at social gatherings and story conferences while demonstrating his total ignorance of Karl Marx. "From what I hear, I don't like it [Communism] because it isn't on the level," he said. Ironically, in the years after his HUAC testimony, Cooper's greatest critical success came with a film scripted by Carl Foreman, a writer accused of Communist biases. In High Noon (1952), a western, Cooper played Will Kane, a retiring town marshal. On his wedding day Kane has to defend himself against an old nemesis—arriving on the midday train—who intends to kill him. As noon approaches, both the townspeople he has served and his bride desert him. Cooper masterfully played the tortured marshal, whom he admiringly identified with his father. His physical maladies and weariness, which so hampered his later performances, worked to his advantage in High Noon. So did close editing, skillful direction, and an evocative musical score. The film brought Cooper a second Academy Award for best actor. Cooper's subsequent roles drew mixed notices. Occasionally critics underrated good films such as Vera Cruz (1954), directed by Robert Aldrich, and Man of the West (1958), directed by Anthony Mann. Most hailed his portrayal of a Quaker father in Friendly Persuasion (1956). Otherwise he remained subject to miscasting or indifferent work and inept direction, problems he eventually recognized. By 1960, Cooper had decided to alter the direction of his career. Entering television, he narrated a widely hailed documentary, "The Real West" (1961), which tried to separate the frontier realities from the images in the television westerns he had come to detest. Cooper also planned to play more morally ambivalent characters, beginning with The Naked Edge (1961), in which he portrayed a mercurial businessman suspected of murder by his wife. As Cooper lay dying of cancer, Pope John XXIII, President John F. Kennedy, and Queen Elizabeth II sent get-well messages, which demonstrated Cooper's position as a beloved modern folk hero, and also the industry's mythmaking capacity. He died at Los Angeles on May 13, 1961. His death, which followed Gable's by about six months, seemed to many to signal the end of an era in Hollywood. 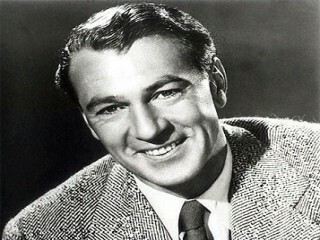 View the full website biography of Gary Cooper.